Yves here. A useful background piece. Because of its size and interconnectedness, developments in the US economy are bound to have important effects around the world. The US has the world’s single largest economy, accounting for almost a quarter of global GDP (at market exchange rates), one-fifth of global FDI, and more than a third of stock market capitalisation. It is the most important export destination for one-fifth of countries around the world. The US dollar is the most widely used currency in global trade and financial transactions, and changes in US monetary policy and investor sentiment play a major role in driving global financing conditions (World Bank 2016). At the same time, the global economy is important for the US as well. Affiliates of US multinationals operating abroad, and affiliates of foreign companies located in the US account for a large share of US output, employment, cross-border trade and financial flows, and stock market capitalisation. Recent studies have examined the importance of global growth for the US economy (Shambaugh 2016), the global impact of changes in US monetary policy (Rey 2013), or the global effect of changing US trade policies (Furman et al. 2017, Crowley et al. 2017). How synchronised are US and global business cycles? How large are global spillovers from US growth and policy shocks? How important is the global economy for the US? 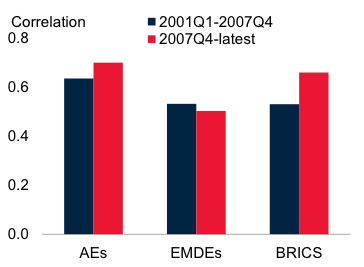 Business cycles in the US, other advanced economies (AEs), and emerging market and developing economies (EMDEs) have been highly synchronous (Figure 1.A). This partly reflects the strength of global trade and financial linkages of the US economy with the rest of the world, but also that global shocks drive common cyclical fluctuations. This was particularly the case at the time of the 2008-09 Global Crisis. It is not a new phenomenon, however. Although the four recessions the global economy experienced since 1960 (1975, 1982, 1991, and 2009) were driven by many problems in many places, they all overlapped with severe recessions in the US (Kose and Terrones 2015). Other countries tend to be in the same business cycle phase as the US roughly 80% of the time (Figure 1.B). 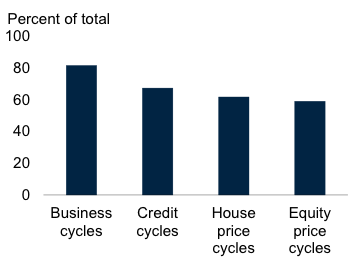 The degree of synchronisation with US financial cycles is slightly lower, but still significant – credit, housing, and equity price cycles are in the same phase about 60% of the time. Although it is difficult to establish empirically whether the US economy leads business and financial cycle turning points in other economies, recent research indicates that the US appears to influence the timing and duration of recessions in many major economies (Francis et al. 2015). Sources: Haver Analytics; World Bank; Kose and Terrones (2015); IMF. Notes: Contemporaneous correlations between cyclical component of US real GDP and cyclical component of real GDP of advanced economies and EMDEs. Notes: Average share of years in which business cycles in the US and all economies were in the same phase. A higher share suggests more synchronization between two countries. A surge in US growth – whether due to expansionary fiscal policies or other reasons – could provide a significant boost to the global economy. Shocks to the US economy transmit to the rest of the world through three main channels. An acceleration in US activity can lift growth in trading partners directly through an increase in import demand, and indirectly by strengthening productivity spillovers embedded in trade. Financial market developments in the US may have even wider global implications. US bond and equity markets are the largest and most liquid in the world and the US dollar is the currency mostly widely used in trade and financial transactions. 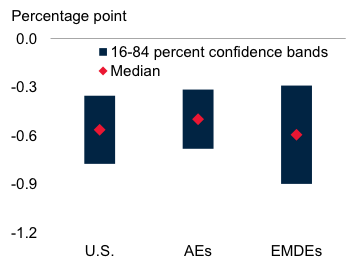 This makes US monetary policy and investor confidence important drivers of global financial conditions (Arteta et al. 2015, IMF2015). Given its role in global commodity markets (the US is both the world’s largest gas and oil consumer and producer), changes in US growth prospects can affect global commodity prices. This affects activity, fiscal and balance of payment developments in commodity exporters. 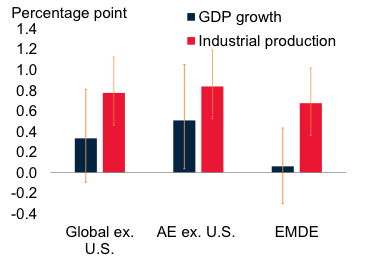 Estimates indicate that a percentage-point increase in US growth could boost growth in advanced economies by 0.8 of a percentage point, and in emerging market and developing economies by 0.6 of a percentage point after one year (Figure 2.A). Investment could respond even more strongly. A boost to investment could come for instance from fiscal stimulus measures – but the effect would largely depend on the circumstances of the implementation of these measures, including the amount of remaining economic slack, the response of monetary policy, and the adjustment of household and business expectations to the prospect of higher deficit and debt levels. A faster tightening of US monetary policy than previously expected could, for instance, lead to sudden increases in borrowing costs, currency pressures, financial market volatility, and capital outflows for more vulnerable emerging market and developing economies. Even in the absence of actual policy changes, heightened uncertainty driven by financial market volatility or ambiguity about the direction and scope of US policies could discourage investment both in the US and in the rest of the world. Empirical estimates suggest that a sustained 10% increase in US stock market volatility (specifically, the VIX) could, after one year, reduce investment growth in the US by about 0.6 of a percentage point, in other advanced economies by around 0.5 of a percentage point, and in emerging market and developing economies by 0.6 of a percentage point (Figure 2.B). Sources: Haver, Bloomberg, World Bank estimates. Notes: Cumulative impulse responses of GDP growth in other advanced economies (AEs) and EMDEs to a percentage-point increase in growth in real GDP in the US. Growth spillovers are based on a Bayesian vector autoregression model. The sample for other AEs includes Eurozone (19 countries), Canada, Japan, and the UK and 19 EMDEs for 1998Q1-2016Q2. Notes: Cumulative impulse responses after one year of investment growth in the US, 23 other AEs, and 18 EMDEs to a 10% increase in the US VIX. Vector autoregressions were estimated for 1998Q1-2016Q2 with two lags. Important as the US is to the global economy, the US economy is also affected by its trade and financial linkages with the rest of the world. Global economic developments play an important role in driving activity and financial markets in the US. US multinationals account for a large share of US output and labour productivity growth, and their presence in financial markets is large. In turn, foreign multinationals operating in the US provide a large share of US employment and exports (Figure 3.A). Much of the global value chain activity is conducted through US multinational corporations and their affiliates abroad. Overall, one-quarter of US exports represents US value added embedded in other countries’ exports. This ‘forward participation’ is particularly high in chemicals, business services, and electronics, and with China, Canada, and Mexico. ‘Backward participation’ is more limited: the average import content of US exports was 13% in 2014, well below the average for other advanced economies (27%). This interconnectedness is an important source of spillovers between the US and the global economy. As a result, growth setbacks originating in other economies, or policy changes affecting market access of US companies, can have detrimental effects on the US. These effects are particularly noticeable in the more globally integrated manufacturing sector (Figure 3.B). Sources: Bureau of Economic Analysis, World Bank estimates. Notes: Share of multinational corporations in US sales, exports and imports of goods and employment. “Sales” indicates sales of multinational corporations in gross output of US private sector industries. Data covers 2010-2013. Notes: Cumulative impulse responses after one year of GDP or industrial production (IP) growth in the US following a 1 percentage point increase in GDP or industrial production growth in 22 other AEs and 19 EMDEs (13 EMDEs for industrial production). 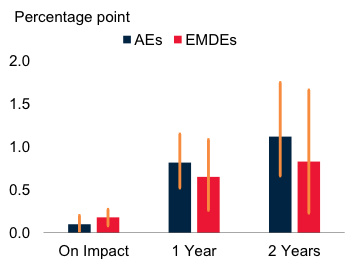 ‘Global’ indicates the weighted average impact of AEs and EMDEs. Vertical lines indicate 16th-84th percentile confidence bands. Vector autoregression models are estimated for 1998Q1-2016Q2 with four lags. Given its size and the strength of its ties with the global economy, shocks to the US economy are transmitted globally through many channels. On the one hand, an acceleration in US growth could be expected to have positive effects for the rest of the world, if not counterbalanced by increased trade barriers or an unexpected tightening of global financing conditions. On the other hand, persistent policy uncertainty could hamper growth throughout the global economy, and could have particularly adverse effects on investment growth in emerging market and developing economies, which have already showed weakness in recent years (World Bank 2017). Editor’s note: The findings, interpretations, and conclusions expressed in this article are entirely those of the authors. They do not necessarily represent the views of the World Bank, its Executive Directors, or the countries they represent. This entry was posted in Economic fundamentals, Globalization, Guest Post on February 27, 2017 by Yves Smith. I believe that, by far, the main channel that connects the economies of the world is the movement of capital. Capital exchanges exceed by far the exchange of goods and services. Capital markets are the drivers for international services & goods exchanges, price changes, investments… They act as the transmission channels of economic/financial shocks as well. Competitivity issues, trade barriers etc. play a minor role. Failing to understand this is a big mistake. Focusing on competitivity issues while ignoring oversigth of capital markets is a big mistake. I’m guessing they are referring to things like the financial meltdown from 2008 when the global economy was heavily invested in side bets on the US housing market. That total derivative market was much larger than the value of the actual underlying real estate. Also guessing something similar exists with commodities, etc. Countries might exchange a thousand metric tons of wheat for example but the futures contracts and other associated derivatives corresponding to the exchange may be much larger in value than the actual product being sold. It can be explained using examples. Let me illustrate with EU policies. Years ago (by 2000-2007), Spain was said to be non-competitive. The country run an enormous (about 10% at its heigth) current account deficit and the standard narrative said that inflation and salaries were to high in comparison with Germany or other “core” european countries. That is at odds with reality. Direct comparisons of salaries showed that in fact salaries were much lower in Spain, then the economists turned to the productivity meme. Spanish workers were less productive than their german counterparts and that was the fact that you obtained by simply dividing GDP/salaries obtaining Unit Labor Costs. Then, it was explained, the problem was “structural” with too high overall salaries compared with total national productivity. Spain was involved in activities creating too little value (agriculture, real estate, tourism). Everybody had to earn less to achieve competitivity. More R&D, industrial activity creating high-end valuable stuff, education, entepreneurship, etc was needed. This is the standard narrative. The fact was that “core” european countries had been themselves transferring, for years, income from households to other sectors (state and companies), for instance, via their favourite VAT increases, and repressing wages. This reduced consumptiom and this “savings” were not invested in Germany but exported abroad. As a consequence of demand shortage, Germany exported capital abroad and conversely obtained large current account surpluses, the obverse of capital account deficits. The massive net capital transfers found their way in what investors considered a safe and profitable investment: housing in Spain (Iceland, Ireland…). Massive capital entries or surpluses (not high salaries) caused enormous current deficits in these countries. Capital found easy entry through open markets with expanding tools for capital investments (structured debt etc.). Needless to say how it ended. Needless to say also, that capital found its way to insure their insane investments forcing the states to act as insurers of last resort. Capital rules. They ensured their returns through sovereign guarantees that transferred the risk to the so called “pigs” states and when the bubbles exploded and capital flows dried these pigs turned magically competitive (structural changes say economists, unemployment in practical terms) and current accounts turned to equilibrium. In this period there have not been real productivity gains, except in state accounting books. Just a lot of unemployment when capital stopped flowing. Austerity forced the situation even more and now Spain (Portugal, Greece…) “accomplishes” a current account surplus, in econospeak, Spain is “competitive”. Needless to say, this has left a giant debt problem on the shoulders of fewer and fewer incomes, no matter how “competitive” they are. The debt is still growing and has no means to diminish significantly unless capital exporting countries revert policies. The “structural” current account surplus, more precisely, capital account deficit, of Germany or Netherlands is the elephant in the room, yet not addressed by our EU economic geniuses. Thank you for an excellent point, Ignacio. Would add that past policy efforts by some of the so called “Emerging Markets” nations to immunize themselves from “Hot Money” capital flows have failed (here’s looking at you, Brazil). Why? To Mosler’s very insightful observations, I would only add that it seems necessary to me for a nation to run a current accounts deficit in order for that nation’s money to remain a global reserve currency. Quite an interesting paper. I have started reading it. Thanks a lot, C.G!! Is it also not an error to assume that the predominance of the US economy in the world (an artifact of our global hegemony post WWII among other things) is a permanent fixture rather than a temporary phenomenon? I suspect that the waning of our centrality will become more evident as we move further into this century. It will be interesting to see how the American psyche digests such a thing. The ’08 financial crash was a foretaste of the bigger “waning of our centrality” to come. What if that so-called growth is mostly debt issuance for that growth in The U.S. and globally? Here in The U.S. M2 Velocity, even after The Fed turned off the spigot, continues to plummet. While only one indicator out of many, it’s an important one no? If a company is using cheap money for buybacks to boost EPS (and executive/shareholders pockets), that’s not really “production” is it? Good and/or bad “acceleration”? This seems to be a naked plea a) to Trump to leave “free” trade alone, b) to R’s not to focus on deficit reduction (several mentions of the possibility of US “fiscal stimulus, which seems highly unlikely) and c) to Yellen to leave interest rates alone. And an unstated recognition that no other national governments are likely to take measures, or indeed really have any interest at all, in promoting global growth. Overall, one-quarter of US exports represents US value added embedded in other countries’ exports. So a fourth of our “exports” are not really exports, just the accounting for white-collar work embedded in mfg work we have done overseas so that US corps can avoid paying US blue-collar workers to make the stuff we buy. If you net these “round-trips” out of trade statistics, the trade deficit is even worse. 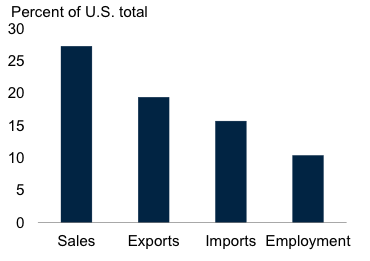 In turn, foreign multinationals operating in the US provide a large share of US employment and exports Well, according to the chart, more than 25% of total sales, but only about half that in total employment. Sounds about right. So does “industrial growth” or “industrial recession” have that much of an effect on GDP? Just a 2% (?) slack in industrial growth sends GDP into the toilet. Which means our economies, the health of which are still being measured by industrial production, clearly need another paradigm. Stg. compatible with the environment and other realities. And as far as international global trade goes, it is obviously not a solution. As Schaeuble once said, ‘we can’t all trade our way out of this mess.’ The information above is proof of how out of sync with the planet global economies are. Really the whole practice is just one tiny step removed from good old mercantilism, run by multinational corporations. Multi-national corporations, those called MNCs in a prior era, were once identified as supra-state actors that could influence policy and undermine sovereignty. Curiously, much of that prior concern has morphed into narrower discussions, at least those more widely publicized, along the lines of repatriation of capital. Good PR isn’t cheap. The writer needs to get out more. The correlations during the new world order of multi-national labor arbitrage was never sustainable. With the shale oil crisis destroying labor arbitrage’s comparative advantage, the correlations will implode.